Buy your Texas Hunting License Online. A hunting license is required of any person, regardless of age, who hunts any animal, bird, frog or turtle in this state (except furbearers, if the hunter possesses a trapper's license). No license is required for nuisance fur-bearing animals, depredating hogs or coyotes (see below). Non-residents under 17 years of age may purchase and hunt with the Special Resident Hunting License. Coyotes, if the coyotes are attacking, about to attack, or have recently attacked livestock, domestic animals, or fowl. Depredating feral hogs, if a landowner (resident or non-resident) or landowner's agent or lessee is taking feral hogs causing depredation on the landowner's land. Fur-bearing animals, if the hunter possesses a trapper's license or if the fur-bearing animals are causing depredation. Texas Resident Active Duty Military Super Combo Hunting and Fishing License Package. Valid only for residents and non-residents younger than 17 and residents 65 years of age and older. Valid to hunt any legal bird or animal. Stamp endorsement requirements apply to persons 65 and over. Valid to hunt any legal bird or animal (including deer). Stamp endorsement requirements apply. Valid to hunt: Exotic Animals , all legal game birds (NOT VALID FOR TURKEY), all nongame animals, squirrel, javelina and alligator (not valid for other game animals, NOT VALID FOR DEER). Stamp endorsement requirements apply. Legal for any period of 5 consecutive days (valid hunting dates will be printed on the license when issued). 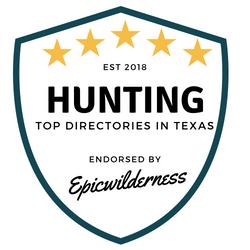 Valid to hunt: Exotic Animals, all legal game birds (except turkeys), all nongame animals, squirrel, javelina and alligator (not valid for other game animals, NOT VALID FOR DEER). Stamp endorsement requirements apply. Valid only to hunt banded game birds (bobwhite quail, partridge, pheasant, mallard ducks) on private bird hunting areas. Required for all persons to hunt, shoot, or take for sale those species classified as fur-bearing animals or their pelts. Required of a landowner or landowner's agent who leases hunting rights to another person on property they own or control for pay or other consideration. The license must be displayed on the property. License fee: $75 for 1 through 499 acres; $140 for 500 through 999 acres; or $240 for 1,000 acres or more. NOTE: Record book no longer required. In addition to a hunting license and migratory game bird stamp endorsement, this permit is required of all sandhill crane hunters; available at all license sales locations. All permittees should keep a record of hunts and harvests, because 26% of permit holders will be chosen for a federal harvest survey.